In front is Black and Blue Sage. In the background, the tree is Texas Lilac Vitex. And under the tree on the left is Powis castle artemisia, and on the right is White Gaura. 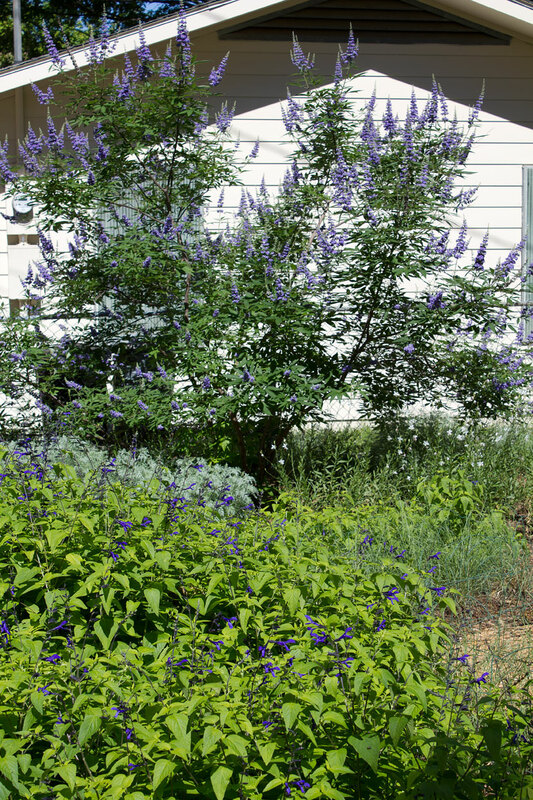 This Texas Lilac Vitex has really grown since last year, and that’s after quite a bit of pruning this past winter. But the Black and Blue Sage and the Gaura are just now beginning to bloom after a long cooler-than-usual spring. The flowering perennials may not be as bodacious as last year, because I chose not to add compost this spring. Last year the garden and newly prepped beds created monster plants that had a difficult time staying healthy during the long hot summer. Smaller plants have a better chance enduring the heat without succumbing to disease. Thanks, Saira! Now if I could only train the twins to use the gravel paths and not crash through the planting beds.